Occasionally I plan to make a pan sauce after browning meat and find that the fond in the bottom of the skillet is just too blackened to make a good sauce. I came up with this “gravy” after a recent meal featuring skillet seared pork chops. The chops were nicely browned however the fond in the bottom of the pan was too far gone to use. Luckily pork and mustard have an affinity for one another so this recipe did the trick. It was also tasty on the roasted broccoli we served. Combine the flour and fat in a small bowl to form a paste. This is called a beurre manié and it will be used later to thicken the sauce. If you don’t have bacon fat then unsalted butter could also be used. Add the Worcestershire and water in a sauce pan and bring to a simmer. Add the mustards, whisk to combine and simmer over medium-low heat for 5 minutes. The mixture will reduce slightly in volume. Stir in the heavy cream. Allow the mixture to return to a simmer and add the burre manié you made in the first step. Whisk the sauce until it is fully melted and incorporated. Allow the sauce to simmer for another minute; it should thicken into a nice sauce. Don’t be scared off by the beurre manié. You can use any softened solid fat, such as butter or even the odd tablespoon of Crisco. Use a fork, or the back of the spoon, to press the fat into the flour until it is well combined. The idea is that the fat-coated flour particles will melt and help thicken the sauce as it simmers. Additionally the fat added at the end will add a soft sheen, similar to the effect of finishing a sauce by whisking in cold butter. I made this on a whim after looking for appetizer ideas for our family Easter lunch. I decided to make Bacon Jam and Brie Phyllo Cups however their bacon jam was nothing more than bacon added to apricot jam. I knew I could make something better. This has a bit of a kick to it; adjust the sriracha to your taste. Heck, leave it out if spicy isn’t your thing. I’m already picturing some of this jam on a slice of toast with some apple slices and cheddar cheese. In a glass 2-cup measuring cup combine the coffee, brown sugar, sriracha, vinegar and maple syrup. Stir until the sugar is dissolved. Set aside. Chop bacon into 1″ pieces. Place a large, heavy-bottomed pot, such as a dutch oven, over medium-high heat. Add the bacon and cook until the bacon is lightly browned and starting to crisp. Move the bacon to a paper-towel-lined bowl and pour off the rendered bacon fat. Return 1 tablespoon of the bacon fat to the pan and add the caramelized onions and garlic. Stir into the bacon fat and cook until you start to smell the garlic. Add the liquid ingredients and combine. Scrap the bottom of the pan to release any bacon fond that may have been created at the beginning. Bring the mixture to a simmer and return the bacon to the pan. Simmer over low heat for about 2 hours, stirring periodically. Allow the mixture to cool, in the pan, for 20-30 minutes. Reserve about a 1/2 cup and set it aside. Transfer the rest into a food processor and process until smooth. Add the reserved bacon mixture and give it 1 or 2 pulses just to combine. Taste and season with salt, pepper, sriracha or vinegar to your own taste. Store in an air-tight container and enjoy. I use caramelized onions because I had them on hand. You could also thinly slice enough yellow or sweet onions so you have about 3 cups and cook them in step 3 with a generous pinch of salt for 10-15 minutes over low heat. Then add the garlic and continue from there. This recipe is heavily influenced by this one I found on Pop Sugar along with 4 or 5 others I looked over that had similar combinations. Don’t get hung up on the word pesto. While it traditionally made with basil and pine nuts the word can refer to any “sauce” made from a similar blending or pounding process. Words evolve, just as we now make pesto in a food processor instead of a mortar and pestle. The original recipe called for a cup of walnuts. We have a friend who is allergic to black walnuts so we don’t risk it even though supermarket walnuts rarely contain black walnuts. A mix of nuts works perfectly well, just give them a nice toasting before you add them to the food processor. Sofrito is a cooking base used in Latin American, Spanish, and Portuguese cuisine. Each cuisine has it’s own take on the ingredient list however the result is always a flavorful mixture that brings a depth of flavor to whatever dish it is used in. My recipe is based on a couple I’ve used over the years. Due to a friend with a ‘cilantro tastes like soap’ sensitivity we use a lot of parsley with only a bit of cilantro when making this. Place onions and peppers in the bowl of a food processor. Process in 10 1-second pulses. Scrape down the sides of the bowl. Add the remaining ingredients. Process until you have a fairly smooth and well-blended mixture. 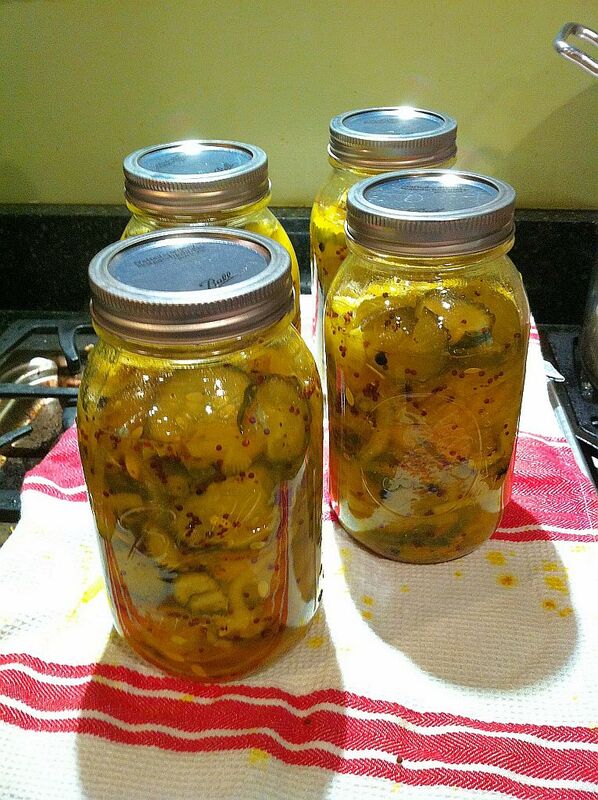 Use immediately or store in the fridge for 3-4 days. The mixture will be quite wet. You can drain the amount you need in a sieve for 30 minutes before cooking it. Or just use it as is and cook off the moisture. Notes I find online suggest it freezes well however it gets used before any makes it too the freezer. 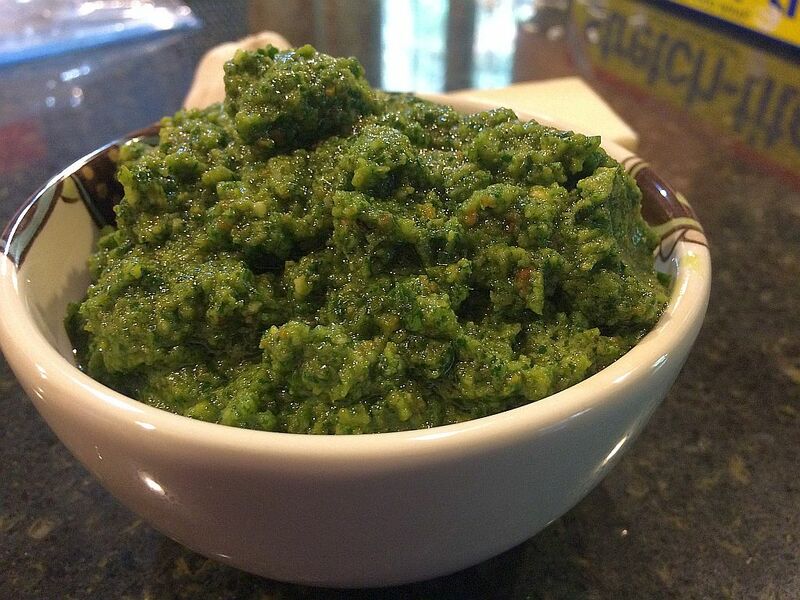 Chimichurri is a bright green sauce with a heavy punch of garlic. It originates from Argentina and is great along side grilled meats of all varieties. The garlic, and small amount of red pepper flakes, give it a bit of heat on the tongue as well. This is best if you make it about 30 minutes ahead so that the flavors can meld. Don’t bother refrigerating if you plan to use it within an hour. Add garlic and parsley to the bowl of a food processor. Process in 10 1-second pulses and scrape down the bowl. Add oil, vinegar and water to the bowl, process for an additional 5 1-second pulses. Scrape down the bowl. Add salt, peppers, and lime juice. Process for 5 seconds. Taste and adjust seasoning as desired. The bunches of parsley at my grocery store are kind of puny so I used 2. If you find (or grow) generous bunches of parsley then you’ll need less. Given that this is made in the food processor I used the stems as well as leaves. After cutting into about 3 sections each the 2 bunches totaled maybe 4 loose cups. You could substitute a bunch of cilantro for one of the bunches of parsley. We had leftover grilled chicken breast, chimichurri and sour dough left over. I think a chimichurri chicken salad might be in our future. Based on this recipe from Cook’s Illustrated (May ’01). I’ve modified it for what I had on hand, and general laziness.